Edit 4th October- My third and final contribution to the Hepburn Jam. For this one I was trying to go for that 50's/60's movie poster feel. Here's a link to the original black and white ink drawing. 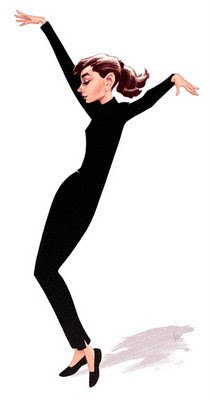 Edit 29th September- Above is my second Audrey Hepburn caricature from the Drawing Board Jam. This one came a lot quicker and easier (most likely as a result of all the practice I had on the first one below). Much, much happier with the likeness on this one. I used an old Tombow brushpen and added some more detail in Photoshop. By the way, I realy like your style(the Thing is absolutely amazing). I try hard to become your kind of talent. Mikel- Thanks. 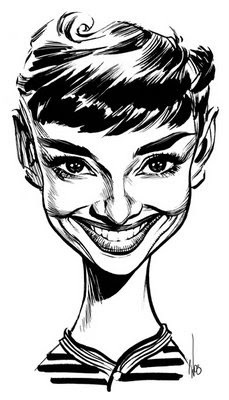 There's currently an Audrey drawing jam over at the NCN forums (National Caricaturists' Network) and the idea caught on over at The Drawing Board, since some NCNers also posted their pics on the DB forums. Right on man, I've never been able to wrap my mind around doing caricatures.. This is awesome. hey ! Jason Seiler just made the same girl .... ! i PREFER THIS ONE EXECUTION, TECHNIQUE AND SYMBOLISM BETTER SUIT HER PERSONA...BRILLIANT! the first is great but the second is unmistakable man. fantastic artwork! Both are wonderful Chris! But I have to agree that the second attempt came off much better IMO. Nice work as always though mate! Superb drawings both. 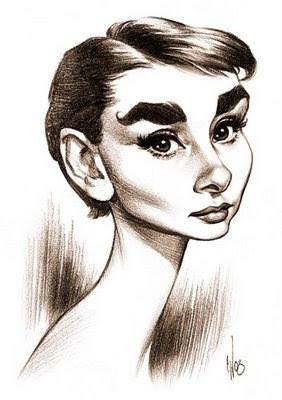 You got the gamine/elfin quality of Audrey in the first attempt (and lovely soft pencil rendering). Nice lively likeness on the second, and beautifully inked as always. Yoiur second attempt is a pure beauty. Very impressive and expressive ! Fantastic work! That first illustration is a good salve for anyone who still remembers that awful GAP TV commercial with the repurposed Audrey footage. Thankyou as always for your generous comments. Despite the first pencil one being a toughy, they were all great fun to do. She's such a pleasure to draw. Really nice, Chris. Audrey is one of my favorite actresses and you captured her spirit beautifully.